In a recent conversation about Peter F. Hamilton, I mentioned that I had been nosing about on the Web, trying to find out what his next project is. I said I had learned only that it was a new series called Great North Road, and that nobody seemed to know any details about it. That turns out not to be entirely accurate. It’s a stand-alone novel, not a series. And Hamilton has dropped a few hints about it in his blog, which I was avoiding (for fear of encountering spoilers) until yesterday, when I finished the Void Trilogy. Then it’s onward to the next book. Hopefully (I say that because nothing is signed yet) it will be a stand-alone in a new and different universe. There’s a lot of reading/research I have to do, but the basic outline is already there. The central theme is about an expedition who are trying to find evidence of an alien on a planet where evolution apparently never produced animal life, except for someone who decades before tried to use “the monster did it” as an excuse to explain away a murder she was found guilty of. This is of course a huge simplification, but I have high hopes that I can add some complexity to that situation. I normally do. Following that, in 2012, it will be a stand-alone SF novel, Great North Road, which is set in a completely new and different universe, so not the Commonwealth, Confederation, Mandel, or even the Fallen Dragon one. I’m looking forward to that. There are a lot of notes already written, and I’ve even got a map. I’ve started calling it my monster in the dark novel, which is almost accurate. So here’s the scene. You’re a taxi driver taking four blokes to the airport, driving down the motorway. They are going on a weekend golf break together, so there’s a lot of cheerful banter. Then one of them suddenly, and in a perfectly serious tone, announces: Oh yeah, I need to visit Newcastle to find a good location to murder someone. Do you a) remain calm and wait until they’re out of your cab before frantically calling the police? b) swerve over several [of] the lanes on the motorway in shock? The correct answer was: b. However, happy ending, one of the other blokes in the cab leans over and quietly says to you: it’s all right, he’s a writer, he’s talking about research. [. . .] Great North Road . . . has a planet with an equatorial zone where all planes are in danger from dust which falls out of the planet’s ring system. I’m back working on the notes for Great North Road. A process which started last week with that trip to Newcastle where I stayed overnight. So I now know where the murder is going to be, and where the body’s going to get dumped in the river. And for those who read my last blog: this time, when I was in the taxi between the train station and the hotel, I managed to keep my mouth shut as to why I was visiting the city. Bill Slavicesk’s Ampersand column from a few weeks ago announcing the release of the digital character builder has been revealed to be a tone-deaf piece of self-celebration that either lies or is incredibly ignorant. We are moving to a web-based solution to make the tools accessible to multiple platforms. The web-based solution makes it easier for us to react to new technology opportunities, such as tablets and mobile devices. We also wanted to move to a solution that promotes individual account ownership and hinders piracy. Finally, we wanted a solution that would more easily interact with our community site and Facebook, for example. “Individual account ownership”? What does that mean? How is that different from the previous version? It sounds like they are going to try and stop people from sharing accounts. Okay, great. But don’t sell that as a feature that will improve the user experience. “Hindering piracy”? “Interact[ing] with our community site and Facebook”? Sweet. Those people who can use the app can post it in their status. What about the rest of you? There are five things I really, really like about the new Character Builder. It’s ultimately portable. I can use it on any computer or computer-like device, wherever I am. It’s both PC and Mac friendly. I can access it from either kind of machine. The first item is patently untrue. What it means is “I can use it on any computer that I happen to use“. Are Linux machines not computers? Are Android phones or iPhones not computer-like devices? I’m baffled to think of anything that counts as a “computer-like device” that the new Silverlight-based Character Builder runs on that isn’t a Windows or Mac desktop. So, if you’re a D&D Insider, check out the new Character Builder starting on Nov. 16. If you’re not a D&D Insider yet, there will be demonstration videos available to show you what the new Character Builder can do. Videos? Really? It’s the Character Builder. The name tells me what it does. I want to be able to use it without paying $10 for the privilege of trying it for a month. I want to be able to use it on my Linux laptop that I take to D&D games. And, heck, since you mentioned it, I’d like to be able to use it on my computer-like Android phone. But if it’s anything like previous software products for Wizards, I’ll still have to grit my teeth and use it because it’s the only game in town. Providing a forum for free expression does not detract from the University’s reputation, but failure to enforce established laws and policies will. Instead of discussing ways to curtail freedom of expression, this should be an opportunity to reaffirm public discourse and uphold the law in a consistent manner that ensures an environment of safety and security. Please review the actions of the protesters and the handling of this situation by the University Police. Now, let’s consider a poll by Rassmussen a few days before our most recent election: 65% of voters would replace the whole Congress, including 82% of the then-minority-party Republicans. Awesome, let’s ditch ’em. We’ve got a majority! But looking over the election results from Tuesday here in North Carolina, we see that every single incumbent congressman won re-election, discounting that Bob Etheridge has apparently lost by a slim margin (~1500 votes), which just shows the lack of a strong movement to replace him. And those re-elections are split pretty evenly between Republican and Democrats. Even the 82% of Republicans who wanted to ditch the whole Congress came out and heartily re-elected “their” representatives. Because if they didn’t, the wrong lizard would have been elected. It’s easy to express discontent with the current arrangement, but when all you have is one alternative that’s inconceivable because the Other Party is terminally Evil/Stupid, you vote for incumbents. Due to recent events on campus involving the Free Expression Tunnel[,] an emergency meeting of the African American Student Advisory Council (AASAC) is scheduled to take place tomorrow[,] Friday, November 5th at 2:00 PM in the Washington Sankofa Room of the African American Cultural Center (Room 126 Witherspoon Student Center). Elvin James, the Chair of AASAC has opened this meeting to all students. Several University Administrators including myself, will be present. We invite you to attend, listen, participate, share your feedback/suggestions, and ask any questions that you might have. Again, this meeting is open to all NC State students, so please share this information and encourage others to attend as well. Guess which NC State student works from 2-6 on Fridays. This guy. 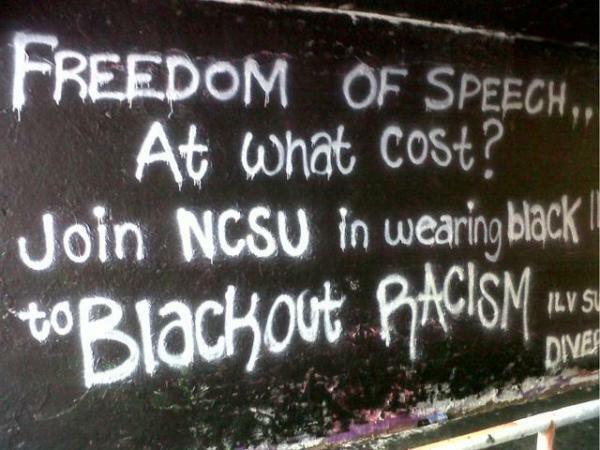 Students have vowed to protest or block North Carolina State University’s Free Expression Tunnel until the university’s chancellor gives guarantees that no hate speech will be allowed there. They were so close to handling this the right way: the article mentions that first they “painted the tunnel black overnight to protest racist and homophobic graffiti involving President Barack Obama painted there earlier this week.” But then, according to the article, they then locked arms and tried to deny people access to the tunnel until their demands for censorship were met. And it just keeps getting better: after they painted over the hate speech (the Right Thing To Do), they painted “Freedom of Speech… at what cost?“. What cost? This! This is the cost! You see stuff you don’t like! And you paint over it! You don’t go to the newly-installed chancellor* and tell him to abrogate the shining beacon of principled tolerance by banning speech you don’t like. That’s the whole point! *On an equally enraging, but unrelated note, the previous chancellor, James Oblinger, who was allowed to resign when it started looking like he hired Mary Easley for a do-nothing job has pretty much been forgotten. Who cares about the old chancellor? We have a new one, which means a new flavor of ice cream! I hope I’m wrong. I really, really hope I’m wrong. Wizards has posted a sneak peek at their new, web-based character creator that we’ve mentioned before. Screenshots at the link. Scheduled for release on the 16th. This release will fix a few problems, like leaving your character on a computer somewhere else. I suppose it’ll also be virtually impossible to pirate the full version now. They’ve also made the concession that you can now subscribe to D&D Insider in monthly or quarterly chunks. However, the new character builder doesn’t currently have any demo functionality and they “hope to make it available soon.” As soon as this one goes live, the old one will stop being available for download, so non-subscribers might want to go ahead a grab a copy of the old downloadable demo. So, the only gains are the lack of need to install, and characters being stored in the cloud. And I already get half that from Dropbox. Silverlight? Really? I can’t think of any reason why a D&D character generator couldn’t be implemented entirely using XML and some server-side scripting. Sounds like they didn’t really build a Web app at all; they just built a Silverlight-based client and moved the data storage to their servers, which is not an improvement in any way I can see. Sounds like the upshot of all this is that the character generator will become unavailable to those of us not willing to subscribe to D&D Insider, which I’m not, especially given how little faith I have in Wizards to do it right. I guess it’s back to paper and pencil.